MacDowell was often stressed in his position at Columbia University, due to both administrative duties and growing conflict with the new university president Nicholas Murray Butler around a proposed two-course requirement in fine arts for all undergraduate students, as well as creation of combined Department of Fine Arts overseeing music, sculpture, painting and comparative literature. :243 After Butler stripped the academic affairs voting rights of Columbia faculty members in the arts and accused MacDowell of unprofessional conduct and sloppy teaching, in February 1904, MacDowell abruptly announced his resignation raising an unfortunate public controversy. After stepping down from Columbia professorship, MacDowell fell into depression and his health rapidly deteriorated. 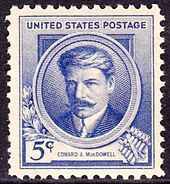 E. Douglas Bomberger's biography notes that MacDowell suffered from seasonal affective disorder throughout his life, and often made decisions with negative implications in the darkest months of the year. Bomberger advances a new theory for the sudden decline of MacDowell's health: bromide poisoning, which was sometimes mistaken for paresis at the time, as was the case with MacDowell's death certificate. Indeed, MacDowell had long suffered from insomnia, and potassium bromide or sodium bromide were the standard treatment for that condition, and in fact were used in many common remedies of the day. MacDowell also was in contact with bromides through his avid hobby of photography.